India: TVS Motor Company, a famous and reputed manufacturer of two-wheelers and three-wheelers in the world, has launched four new products in Bangladesh. The products include premium motorcycle TVS Apache RTR 160 4V single disc, 125cc motorcycle TVS Max 125, 100cc motorcycle TVS Metro special edition and utility vehicle TVS XL100 Heavy Duty ‘i-Touch Start’. These products will target the growing customer demand in each of their respective segment. A two day convention is being organised on 9-10th April 2019 by the Central Council for Research in Homoeopathy (CCRH), an autonomous research organisation, Ministry of AYUSH on the occasion of the World Homoeopathy Day at Dr. Ambedkar International Centre in New Delhi. The World Homoeopathy Day is observed to commemorate the birth anniversary of the founder of Homoeopathy, Dr. Christian Fredrich Samuel Hahnemann. The Convention will be graced by Shri. Vaidya Rajesh Kotecha, Secretary of AYUSH, Sh. Roshan Jaggi , Joint Secretary, Ministry of AYUSH, Sh. Nilanjal Sanyal, Chairman, Board of Governors, Central Council of Homoeopathy and Sh. Tridandi Chinna Ramanuja Jeeyar Swamiji. Tributes will be paid by Dr. Gary Smyth, President, Faculty of Homeopathy, UK and Dr. Alok Pareek, President, LMHI (International). With an aim to recognise exemplary work in Homoeopathy, AYUSH awards relating to Homoeopathy for Life Time Achievement, Best Teacher, Young Scientist and Best Research paper will be conferred on this occasion. This WHD, 24 students will be awarded scholarships under the Short Term Studentship in Homoeopathy (STSH) and four students for ‘Quality MD Dissertation in Homoeopathy’. MOU’s will be signed with two more PG Homoeopathic Colleges with an effort to link education with research. The vision behind the agreement would be to provide impetus to research infrastructure, which, in turn further orient the students towards research. A wide range of topics will be covered in the convention like Linking education and clinical practice with research, Homoeopathic Education: Research component, Utilisation of existing research by clinicians , Drug Development & Validation, Research initiatives by students under Studentship & MD Scholarship schemes , Documented clinical experiences, Homoeopathy in public health, Fortifying theories and clinical practice with research, Road ahead for Homoeopathy, Skill development in scientific writing, Strengthening research infrastructure in educational organisations, Drug Provings and Guidelines for Publishing Research. Round table discussions are also planned on the topics ‘Drug Regulations in Homoeopathy: Current scenario and Way ahead; Homoeopathy Industry: Challenges and Opportunities for the Manufacturers/Traders; Homoeopathic Pharmacopeias: Standards and Harmonisation’ and ‘Promotion of Homoeopathy at state level: Government of India schemes as a facilitating tool; Homoeopathy doctors in public service: Roles & Responsibilities’. The Council is taking this as an opportunity to review the path trodden so far, taking stock of the challenges faced and to formulate future strategies for development of Homoeopathy. There is an imminent need to focus on improving the quality of education and enhancing the success rate of an average practitioner. There is also a need to ensure the production and availability of high quality homeopathic drugs in the market. Polling for Lok Sabha elections in the State of Chhattisgarh will take place in the first three phases of the seven phased General Election-2019. Chhattisgarh is divided into 11 parliamentary constituencies. This includes 4 ST parliamentary constituencies, 1 SC parliamentary constituency and 6 general category parliamentary constituencies. Polling will take place in the State on 11th, 18th and 23rd April, 2019. As per the latest data, the total number of electors for Lok Sabha elections 2019 in the State are 1,89,99,251. The percentage of female electorate is 49.91% of the total electors. There is about 99.99% Electoral Picture Identity Card (EPIC) coverage in the State. The total number of polling stations are 23,727. The number of first time electors in the age group of 18-19 years are 4,90,636 which is about 2.58% of the total number of electors in the state. In the Lok Sabha election 2014, the total number of electors were 1,76,64,520 out of which 49.35% were women electors. The total poll percentage in the State was 69.39%. In the State of Chhattisgarh, only one parliamentary constituency (PC) namely Bastar will be going to polls on 11th April, 2019. The Constituency of Bastar is reserved for the Schedule Tribe and has an electorate of 13,77,946 out of which 6,62,355 are male voters, 7,15,550 are female voters and 41 are others. The Number of Polling booths that have been set up are 1,878. The PC of Bastar comprises of 8 assembly constituencies. The time schedule for polling at various assembly constituencies has been decided by the Election Commission. Polling will take place between 7:00 AM to 5:00 PM in assembly constituencies of Kondagaon, Chitrakot, Bastar and Jagdalpur while polling will take place between 7:00 AM to 3:00 PM in assembly constituencies of Narayanpur, Dantewada, Bijapur and Konta due to security reasons. Saharanpur, x Congress campaigning in western Uttar Pradesh received a set back on Monday when all the three rallies to be addressed by party president Rahul Gandhi along with her sister Priyanka Gandhi Vadra and another senior leader Jyotriditya Scindia were cancelled due to bad weather. The joint rally was scheduled to be held at Shamli in Kairana Lok Sabha seat, Bijnore and Saharanpur. But all the three rallies have been cancelled due to hailstorm and high winds in the region on Monday. In Saharanpur, the announcement of cancellation of the rally was made by Imran Masood, the Congress candidate from Saharanpur, when large numbers of supporters were present at the Gandhi Park meeting spot braving inclement weather. On Tuesday is the last day for campaigning for first phase of polls in UP, where the Congress leaders were supposed to address the rally on Monday. CPI candidate and former Jawaharlal Nehru University Students Union (JNSU) leader Kanhaiya Kumar will submitt his nomination paper tomorow. 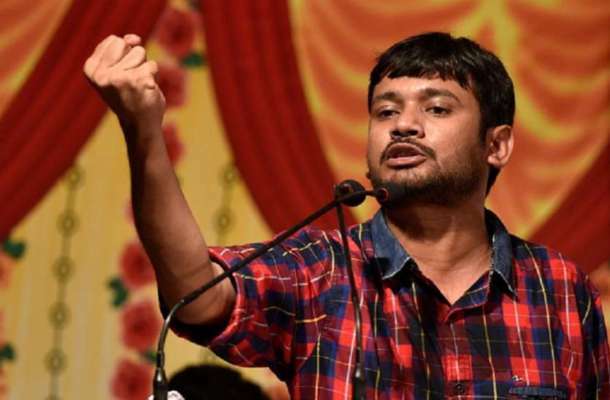 Kanhaiya Kumar is contesting fom Begusarai Lok Sabha constituency in BIhar. Union Minister and senior BJP leader Giri Raj Singh is the BJP candidate here. It is repoted that many celebrities including Bollywood actos will accompany the fiebrand student leader in submitting the nomination form. Bollywood actress Shabhana Asmi, her husband and writer Javed Akhthar, Bollywood actress Swara Bhaskar South-Indian actor Pakash Raj will attend the function. The election campaigning work of Kanhaiya Kumar is going in apace in the constituency. Dalit leader from Gujarat Jignesh Movani, Patidar agitation leader Hardik Patel, Radhika Vemuala, the mother of Rohith Vemula who suicided in Hyderabdh Central University, Fathima Nafees, the mother of Najeeb who went absconding fom JNU after an issue with ABVP activists, former JNSUleaders Shehna Rashid Dora and Delhi University students leader Gurmohith Kour all ae leading the campaign of Kanhaiya Kuamr. Although the RJD has earlier said that it will support Kuma later they fielded their candidate. Thanveer hassan is the RJD candidate in this constituency. The polling will be conducted on April 29. Ms Dutt was accompanied with her brother Sanjay Dutt, husband Owen Roncon, Member of Legislative Assembly Naseem Khan, Kripashankar Singh, Baba Siddiqui, Prof JC Chandurkar. New entrant into politics, Ms Matodkar, tweeted, “Making this new chapter in my life official. Send me your support and blessings as I file my nomination today.” Ms Matondkar has been pitted against Bharatiya Janata Party’s (BJP) Gopal Shetty in the Mumbai North constituency. The maximium city will go to polls in the fourth phase of the general elections on April 29. The results will be announced on May 23. In last general elections, BJP bagged 23 seats, its alliance partner Shiv Sena–18, Nationalist Congress Party–4, Indian National Congress–2 and one by Swabhimani Paksha. A bench headed by Chief Justice Ranjan Gogoi however did not agree to the request of 21 opposition parties leaders that 50 per cent VVPAT slips of EVMs be matched, on the ground that it will require huge manpower and not be feasible in view of infrastructural difficulties. NEW DELHI: The Bharatiya Janata Party (BJP) on Monday released its manifesto called Sankalp Patra’, ahead of the crucial Lok Sabha Elections. The manifesto read: At the very beginning of our current term, Prime Minister Modi embarked on a mission to double farmers’ income. We will make all efforts to achieve this goal by 2022. The manifesto promised: 25 lakh crore investment in Agri-rural sector – We are committed to making an investment of Rs. 25 lakh crore to improve the productivity of the farm sector. Interest-free Kisan Credit Card loans – We will provide sho-term new agriculture loans up to Rs. 1 lakh at a 0% interest rate for 1-5 years on the condition of prompt repayment of the principal amount. The manifesto read: We are committed to the enactment of the Citizenship Amendment Bill for the protection of individuals of religious minority communities from neighboring countries escaping persecution. We will make all efforts to clarify the issues to the sections of the population from the Northeastern states who have expressed apprehensions regarding the legislation. We reiterate our commitment to protect the linguistic, cultural and social identity of the people of Northeast. Hindus, Jains, Buddhists, and Sikhs escaping persecution from India’s neighboring countries will be given citizenship in India. The Manifesto read: Our security doctrine will be guided by our national security interest only. This is exemplified by the Surgical Strikes and the Air Strikes carried out recently. We will firmly continue our policy of Zero Tolerance’ against terrorism and extremism and will continue to follow our policy of giving a free hand to our security forces in combating terrorism. The manifesto read: Strengthening our Armed Forces – We will speed up the purchases of outstanding defense-related equipment and weapons. In order to equip the Armed Forces with modern equipment, we will continue to take focused steps to strengthen the strike capability of the Armed Forces. The Manifesto read: We reiterate our stand on Ram Mandir. We will explore all possibilities within the framework of the Constitution and all necessary efforts to facilitate the expeditious construction of the Ram Temple in Ayodhya.